The Teiresias algorithm is a combinatorial algorithm for the discovery of rigid patterns (motifs) in biological sequences. It is named after the Greek prophet Teiresias and was created in 1997 by Isidore Rigoutsos and Aris Floratos. Teiresias should be used for the discovery of exact or more lenient similarities within a set of character sequences. In other words, Teiresias finds all patterns that exist in the input using each input character as a unit. It was initially developed for the discovery of sequences of amino acids of sequenced data but can be used in any text mining setting. You can download the Teiresias source files for local use here and you can access our Teiresias web tool here. Pattern: The Teiresias algorithm uses regular expressions to define patterns. The patterns created by the algorithm are <L,W> patterns that have at least k instances in the input, where L ≤ W and L, W, k positive integers. A pattern is called an <L,W> pattern if and only if any L consecutive literals or bracketed literals span at most W positions (i.e. there can be no more than W-L wild cards). -v: This parameter controls how patterns occurrences are counted. If omitted then all occurrences regardless of the sequence they appear in are counted and taken into account for -k. If it is included in the input parameters then each pattern is counted once per sequence. It should be set depending on what the user is looking for. 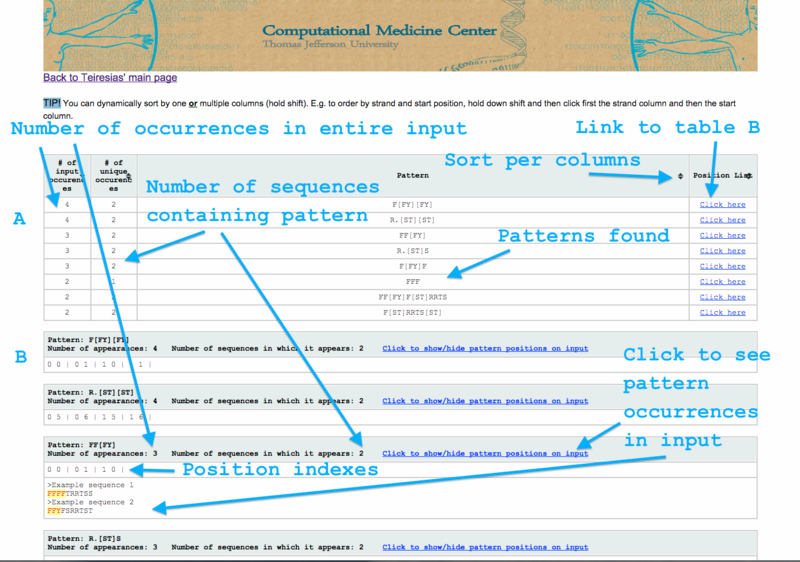 If the number of sequences containing a pattern is sought then it should be set (given as a parameter) if the user is asking how many times a pattern is present on the input file it should be omitted. Please read carefully the following instructions. The correctness of your results depend on the structure of the input and equivalence files as well as on the usage of the parameters. The input file must contain all data you want processed. 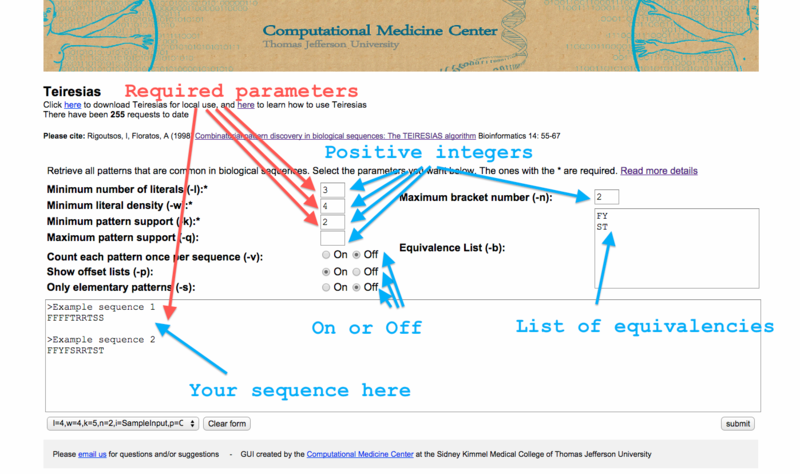 It is assumed that every input file contains sequences and sequence headers. Starting from version 0.9.1 the headers are not required. A header is a line that starts with “>”. Please note that any line that starts with “>” will not be considered by the algorithm and every other line will. Every line that doesn’t start with “>” is considered a separate sequence that spans from the last character of the previous header or the beginning of the file until a new header is found or the end of the file. Unlike previous versions, the input file can contain several new line characters within a sequence. Empty lines are skipped but spaces shouldn’t appear in the sequence lines. Please, keep in mind that the format of the input file is not only important for the proper execution of the program and the proper results but also the header positioning affects the -v parameter. The input must be in ASCII format (.txt files with rich text option turned off). A sample input file with the name “SampleInputTJU.txt”, included in the downloadable files, is the following. The equivalence file has very simple format. Every line is considered by the algorithm and all characters per line are considered equivalent. Each character can appear in multiple lines but once per line. Each line must be unique. The input must be in ASCII format (.txt files with rich text option turned off). A sample equivalence file named “SampleEquivalencesTJU.txt” that is included in the downloadable files is the following. Every time you run the algorithm you have to specify values for -l,-w,-k and -i. All the other parameters can be used independently and in any combination. The order of the parameters doesn’t matter. When setting your parameters try to think how you would like your results to be and select respectively. Below we provide a list of possible desired results and the recommended parameters. Please keep in mind that even more combinations are possible! When unsure about what to use or how you expect from the data to behave, it might be beneficial to set a parameter very high or very low and then gradually tune it until you get the results you are looking for. How to use -i and -o. How to use -l and -w.
The parameter -l controls the minimum number of literals in any pattern which is also the minimum length. The parameter -w controls the number of literals that are indifferent, i.e. the number of wildcards, among every -l consecutive (but not necessarily contiguous) literals. It entails that -w must be larger or equal to -l and that -l/-w shows the literal density. returns patterns that have length at least 6 and all positions have literals. returns all patterns with length at least 4 that can have (-w)-(-l) = 2 wildcards (‘.’) among every 4 consecutive (but not necessarily contiguous) literals and appear at least 4 times in the input file. returns the positions of all appearances after each pattern. The algorithm is executed in two stages. The scanning phase and the convolution. During the scanning phase all patterns that satify the minimum requirements are found and during the convolution the “elementary” patterns are combined and maximized. When -s is used the algorithm stops after the scanning phase. Although the output patterns are not maximized when this parameter is used, the results are returned much faster and include results that are length specific, as seen below. returns all patterns with exactly 5 literals. If you wanted length 5 also you should set -w=-l=5. How to use -k, -q and -v.
The parameter -k controls the minimum number of appearances a pattern can have. The parameter -q controls the maximum. The parameter -v controls how the appearances are counted. If omitted then they are counted per general appearance but if included each pattern is counted once per sequence. There are many interesting combinations among those variables. returns all exact patterns that span at least 3 positions and appear exactly 5 times. returns all patterns with length 4 or more and no wildcards that appear in both the sequences of the sample input file. How to use -b and -n.
The parameter -n controls the number of bracketed literals, it should always be used with -b. These parameters are used when some amount of freedom of replacement is given to the literals but the replacements can only occur within specific groups. Of course they can also be combined with wildcards. The result will be patterns with some specific literals, some literals that can only be chosen among the bracketed ones and some wildcards i.e. literals that can be anything. Keep in mind that unlike -w that signifies the maximum number of ‘.’ among every -l consecutive (but not necessarily contiguous) literals, -n signifies the number of brackets per pattern. If -n is not set but a file is provided using -b, then -n is set to “infinity”. The brackets are trimmed so that only literals that actually appear in the input in those sequences remain. Download the compressed file from here. Right click on the file and un-compress it or open it. Move the folder created on your desktop or the files in a folder on your desktop. Open a terminal window. To do that, go to the launchpad and in the search box write “terminal”, then click on the terminal. On the terminal, type “cd Desktop/name-of-folder/” where name-of-folder is the name of the folder on the desktop containing the files. Press enter. Type “./teiresias -l4 -w6 -k4 -iSampleInputTJU.txt -p” or any other parameters you want and press enter. Open the output file created in the same folder on the desktop to see the results! The Teiresias web-app requires the same parameters as the source code. You can read more information about what each parameter is here. The required parameters are l,w, and k. In short, when a pattern is returned from Teiresias it will have the form, abcdefgh. Some of those literals (here the letters a-h) will be specified (here a letter between a-h) and others will be wildcards (a range of letters). The parameter l defines the number of literals that have to be specified. The first and last literal are always specified, so l must be at least 2. The result of w-l defines how many literals can be wildcards among every w input characters. Hence, w needs to be at least 2. And finally k is the number of times a pattern has to at least appear in order to be reported. In the web app you’ll need to add a positive integer in the boxes beside l,w, k and if you want q and n. And optionally select a value for v, p, and s by clicking on “on” or “off”. Also you will need to add your input and optionally an equivalence list. You can find the required formats for the input and equivalence boxes can be found here. You can also select “Click here for sample parameters” to see an example of the parameters and the results of the app. See the image below for more details. The output is divided into 2 sections (see image below). The top of the page (table A) contains a summary of the results. The bottom contains a collection of tables that contain the detailed results per pattern. Table A has 4 columns. Table B is a collection of tables. Each has 3 lines. link that opens the third line. The second line contains the list of coordinates in which the patterns appears within the input. Each coordinate consists of 2 numbers and is followed by a bar “|”. The first number is the sequence in which the pattern is and the second is the character at which it starts (see also parameter p). The third line is optional and depicts the pattern’s appearances at the input. You can also sort the contents of table A by one or multiple columns. You are visitor number 1471.